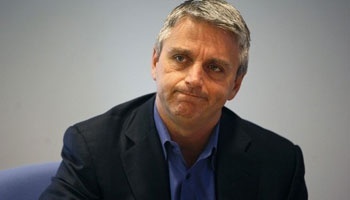 Analysts say Electronic Arts CEO John Riccitiello is running out of time to turn things around at the beleaguered publisher and could be looking at losing his job if things don't change soon. Since taking over as chief executive of EA in 2007, Riccitiello has presided over a precipitous drop in the company's fortunes. Stock value has plunged roughly 70 percent since he took the reins and earlier this week EA reduced its fiscal year financial guidance for 2009, the second year in a row it's been forced to do so. In the wake of that announcement, the company's share price fell another eight percent and analysts are now suggesting that Riccitiello could be facing the axe if he doesn't make things happen quickly. "Anytime you underperform, you should be worried about your job," said Janco Partners analyst Mike Hickey. "An inability to execute on his performance objectives this year could put him at risk." Things are tough for the industry as a whole but EA's continuing slide is especially pronounced when compared to the performance of its primary competitors. Shares in Activision, which recently supplanted EA as the big dog on the block, were up 17 percent last year, while Take-Two Interactive, which spent a big chunk of 2008 battling a takeover attempt by EA, climbing 35 percent. Even troubled THQ managed to post an increase of eight percent. The current EA management team has "zero credibility," according to Wedbush Morgan analyst Michael Pachter. "Investors feel betrayed, and the comment I got most from investors today is, 'They don't seem to care about investors'," he said. "This management team is running out of room to underperform. I think investor tolerance is gone... They don't get another year to turn around." Riccitiello maintained an optimistic outlook during the call to investors this week, saying, "I think we've made good progress - in fact, very good progress. Our view of the sector has been proven right, and we've done a good job of executing the right strategies." But it's impossible to ignore the fact that EA was trading at $52 per share when he took over as CEO and today is mired around the $17 mark. That's not the sort of performance that investors are inclined to reward. The irony for gamers is that after years of excoriating the company for destroying studios and churning out lackluster, cookie-cutter crap, Riccitiello appeared to "get the message" not long after he took over: He claimed to dislike heavy-handed DRM, promised that the company would make a greater effort to create new and better titles (and then actually delivered on that promise) and even appeared to take an enlightened view toward piracy. Yet it's the unabashedly profit-driven Bobby Kotick at Activision who's riding high these days, while EA continues to flounder. I'm pretty sure there's a lesson to be learned in there somewhere.